The ability to learn and speak language depends heavily on the sounds and language we experience during early infancy. While this may sound self-evident, we still do not understand exactly what happens neurologically as a developing infant learns how to speak. In a study published in eLife, researchers at Nagoya University devised a new neurological model in fruit flies that may illuminate this process—and made some key discoveries about insect mating along the way. To get around this intractable problem of complexity, the research team focused on Drosophila melanogaster. This unassuming fruit fly is commonly used in research as a model organism, because its biology is much simpler than humans—but surprisingly similar in fundamental ways. 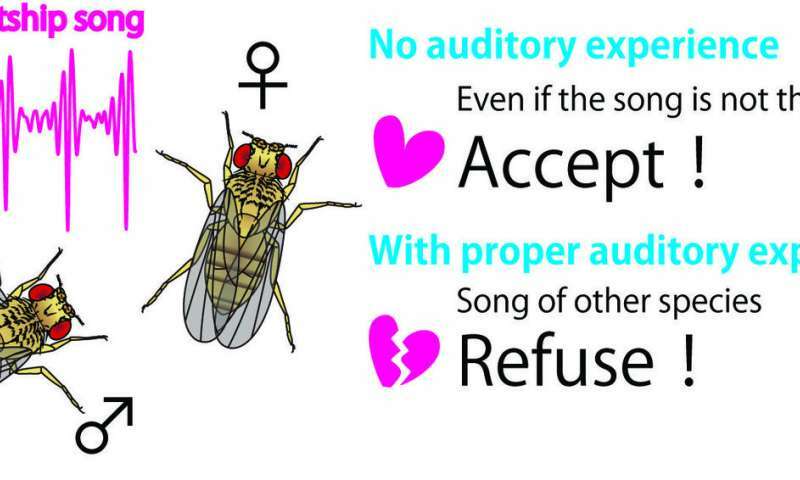 As fruit flies are unable to vocalize, however, the team studied a different mode of communication often shaped by auditory experience: courtship.